The fall meeting is over and Rick Carnegie has been elected president of the Montana Cross Country T Association. He has asked me (Tom Carnegie) to continue doing the newsletter. I will try. Since I am not president maybe I can gather up a little more ambition to do the newsletter. I am on the verge of suffering from burn out after doing this (the newsletter) for four years. I will print the minutes as I got them from Tony Cerovski. "A discussion reveled (sic) that the membership liked the news portion of the letters, but did not care to have the stories continue." That wasn't my impression at all. Only one person said that they could do without the stories and would rather have have more technical-type articles. This person acknowledged that he had never read any of the stories, otherwise he'd have known that most of them contain technical issues. He was apparently suffering under the misapprehension that if I would spend less time on fiction I would have more time to conjure up technical articles. Alas, it doesn't work that way. I have gotten a lot of positive feedback on my stories which is appreciated. As such I will continue to try to write more. The 2005 Montana 500 will be held out of Lewistown Montana, June 19th-23rd. The pre-run inspection will be Sunday the 19th. The run will commence Monday the 20th. The base hotel will be the Yogo Inn 1-406-538-8721. Major rule change this year: All (aluminum and cast-iron) cars will run without restrictor plates. Montana. The meeting began at 10:30 am. Past President, Tom Carnegie opened the meeting and called for nominations of the next two-year president. .Rick Carnegie was elected President by majority vote. ·Scott Stubbert was elected Vice President by majority vote. ·Janet Cerovski was elected Treasurer by a unanimous ballot of yeas. ·Tony Cerovski was elected Secretary by a unanimous ballot of yeas. ·Tony Cerovski was nominated by Scott Stubbert, 2nd by George Nickol. ·Tony Cerovski and Mark Hutchinson were elected to 1-year Director terms. Report, 2nd by George. All yeas, no nays. Old Business was called for and Mike Cuff stated that the City of Eureka and surrounding area enjoyed our Association and event. We are welcome to come back to Eureka anytime. New Business was called for. Dave Huson motioned to increase the annual dues. A discussion reveled that the membership liked the news portion of the letters, but did not care to have the stories continue. Also, it was decided that we would The not pay for color printing because of the expense and because most everyone has no trouble downloading the pictures from Tom Carnegie's "Montana 500" link on the Antique Auto Ranch web site, http://www.antiqueautoranch.com/montana500/index.html. Dave with drew his motion and membership dues will remain at $10.00 per year for now. and separately wire the carburetor bolts. Gary's motion was passed and will be added to the teardown rules as follows. "Drivers or the even the owners may disassemble and reassemble their own cars during the teardown." Race Route: AT 11:30 am, President Rick called for race routs. oShelby was voted out after a discussion on road construction, Great Falls was voted out, and a show of hand between Helena and Lewistown selected Lewistown as the site. oDave Huson and Kathleen Ebbert provided the dates of the National Tour and other events and further discussion occurred. By majority hand vote, June 19-23 was selected for the 2005 race dates. ·Doug Langel motioned for restrictor plates on all cars, 2nd by Gary Ebbert. trucks. A hand vote was called for and the motion failed. oSimilar discussion occurred and the motion carried 12 in favor, 8 against. Rule 33 will be stricken. President Rick called for a 15-minute recess. ·George Nickol motioned for an amendment to the previous rule change and asked one year-race trial period on the rescinding of Rule 33. Motion failed by majority hand vote. ·Steve Coniff motioned for adding a new rule stating "Modification of timer interior allowed." Steve's main point is that the current stock New Day brush holders break, the brush material is a substandard material and that many veteran racers have made modifications to the brush, holder, and covers. oThe motion was put to a vote and was passed. ·Tony Cerovski asked that the above new timer rule statement be changed to "Modification to timer materials and components allowed." Discussion included allowing the use of aluminum or steel ring be allowed with the Crystal Timer instead of the fragile potash. Most members agreed that what ever that was modified on the inside could extend to the exterior. would like to remain a Chapter of the MTFCA and or obtain the event insurance that we should place the above verbiage in to the BYLAWS. A hand vote occurred and we will add the above verbiage to the BYLAWS. I suppose that we will allow a month or so grace period for new and existing directors to become MTFCA members. It is known that the insurance must be purchased by about April. The Following Members and guests attended. I will be sending out the rule changes in the near future. Please supply me with your email addresses as soon as you can. Don't' be left out of the communication circle. Happy Racing, Tony Cerovski, Secretary. I have just about (but not quite) run out of things to write about in regard to making models T's go faster in the Montana 500. I am withholding some information that I may or may not spill later on when I'm no longer serious about competing. I don't know when that day will come. In the mean time I figure some of you may have cars other than Montana 500 cars, and as such I will write a little about some things that may be desired for these cars. This is how I put turn signals on my 1926 coupe. If one wanted, he could sure enough put turn signals on his Montana 500 car. When I set out to put turn signals on my coupe, I wanted something that was unobtrusive. I don't care for the extra non-era lights that lots of people stick onto their cars. I also don't like big turn signal switches hanging onto the steering column. I decided that if I were going to have a small switch, I would need to be controlling low amperage lights that meant LED's. The LED's that I used in the front are amber 1157 LED bulbs. I carved them apart and siliconed the innards to the headlight reflectors. This is not the most visible place to put them, but they can be seen OK during the day, but just barely at night. This is a compromise. Separate lights would be better, but I felt that violated my “obtrusiveness” clause. The rears are stand-alone LED lamps that I got at the local auto parts store. The amber version of these would work well for the fronts. I won’t go into detail about how I ran the wiring. Also, these turn signals are not incorporated into the brake light system, although with a little more work they could be. After the LED’s are in place, you need a switch. I installed a little SPDT switch, with a center off that I got at Radio shack, into the horn button. My original design also had an indicator LED on top of the horn button. This proved inadequate for me. I would continually leave on the blinkers during and after driving. Ultimately I used a beeper to signal that the lights were on. This has proven quite satisfactory. To flash the LED’s I originally had planned to use a blinking LED in series with the switch and hence the other LED’s. This was elegant and worked well until I started the car. It turns out that the RF interference from the coils disrupts the blinking LED. I decided that I needed a more robust flasher. I found some elementary astable flip-flop circuits on the Internet and modified them to better do what I thought should happen. Without going into too much detail, an astable flip-flop is a circuit that automatically switches back and forth between on and off. 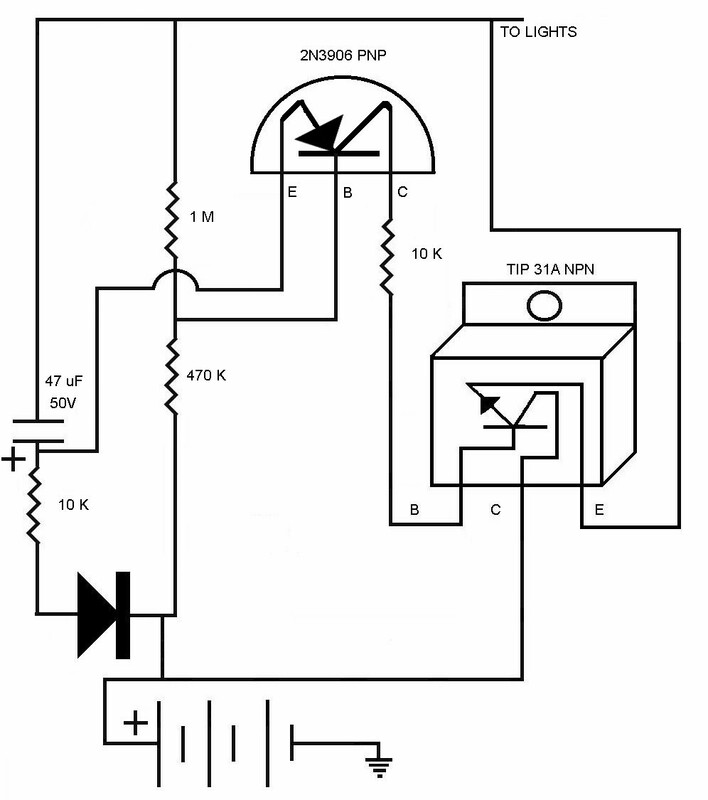 There is a capacitor in the circuit that controls the flash rate as it charges and discharges. Through manipulation of the values of the charging resistors this flash rate can be controlled. I also added a diode in series with the charging resistor. This slows down the discharge time of the capacitor and causes more on time per cycle. Alas, even my discrete component flasher circuit was effected by the RF of the buzz coils. I decided that I needed a filter circuit. I just hung a couple of resistors and capacitors to ground, and that did the trick. I also hooked a beeper that I got at Radio Shack to a couple of diodes. This gives me an audible warning that my lights are flashing. So far I haven't left them on since I installed this. For a power supply I use three 9V transistor batteries wired in series. After loss through the system, that puts about 15V to the lights. More than the 12V they require, but not enough to cause trouble. You could run this circuit off of a 12V battery, but the LED's would not put out full brightness. I experimented with different power supplies, including running the thing off of the magneto. Without a regulator the voltage kept building and building until it was around 50V at which point my circuit blew up. When this happened I replaced the 2N3904 transistor shown in the picture with the more robust TIP31A. I think I will eventually get a charger and some NiMH batteries, but the 9V alkalines that I am using are lasting a long long time. This shows the LED glued into the reflector. I mounted it so that it shines "up". This shows the front light "on". This is showing the rear light mounted to the underside of the trunk. Here is the rear light "on"